The original homelands of the Ottawa contain one of the oldest prehistory sites on the North American continent - the Shaguianday site on Manitoulin Island, Ontario - estimated to be 30,000 years old. The Ottawa ranged over parts of Ontario and the Great Lakes region and, as prolific traders, traveled over vast distances which led to early contact with Europeans. They met Samuel de Champlain in 1615 near the French River in Canada. The arrival of French traders transformed the tribe, engaging them more deeply in European-Indian politics, and the tribe became integral to fur trade. Traditionally the Ottawa lived in wigwams or wikis, wore buckskin clothing, and cultivated corn, beans and pumpkins. One of the greatest Indian chiefs and skilled leaders during this time was Chief Pontiac, a member of the Otter Clan of the Ottawa, who became the head of a loose confederacy consisting of the Ottawa, Ojibwa and Potawatomi Tribes, formed in response to offensive English policies in their territories. The ensuing conflict became known as Pontiac's Rebellion. After the passage of President Jackson's Indian Removal Act of 1830, and due to increasing encroachment by Euro-Americans, the tribe signed over their lands in Ohio, Michigan and Illinois. They were very hesitant to leave their lands, and it wasn't until April 1837 that the Ottawa of Blanchard's Fork, Roche de Boeuf and Oquanoxie's Village agreed to migrate to Kansas where they were allotted 74,000 acres of land. Within five years of the move, nearly half of the Ottawa had died. Realizing their children would need to be educated to survive, in 1862, the tribe gave Baptists acreage for a school, as well as another 20,000 acres to be sold to raise money to build a university for the education of whites and Indians, named after the Ottawa, and the tribe negotiated an arrangement with the university for Ottawa children to be educated free of charge. 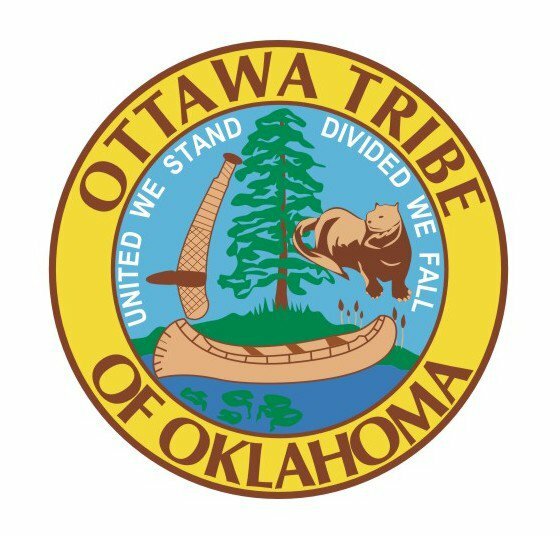 Under increasing pressure to cede remaining lands, in 1867 the Ottawa sold their land in Kansas and moved to northeastern Indian Territory. By this time there were only about 200 Ottawa. In 1956, the U.S. government decided the tribal government served no purpose and terminated its existence. This was a dark period in the tribe's history but they didn't give up and in May 1978, Ottawa Tribal governance was restored, followed by establishment as a federally recognized government.